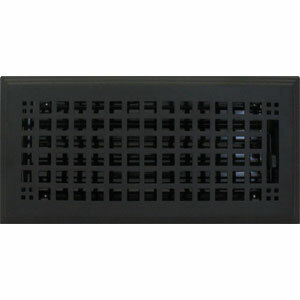 4 x 12 Rockwell Flat Black Floor Register Discounts Apply ! These steel vent covers offer a timeless Arts and Crafts design. Decorative floor registers are crafted of all steel construction for added structural integrity. 4 x 12 steel vent covers feature a fully adjustable damper for air flow control. Decorative floor registers can also be adapted for use on the wall, purchase wall clips separately. Steel vent covers can be installed in the floor by simply placing into the duct hole. Decorative floor registers will blend in with any style of decorating. ***Hint: When ordering your 4 x 12 floor register, industry standards ask that you measure using the actual duct hole opening dimensions and not your existing register's faceplate dimension. These Arts and Crafts design floor registers will fit a 4 x 12 inch hole opening. Steel vent covers can also be used as a sidewall register. You can purchase spring clips for this. Decorative floor registers are as functional as they are beautiful, order yours today!